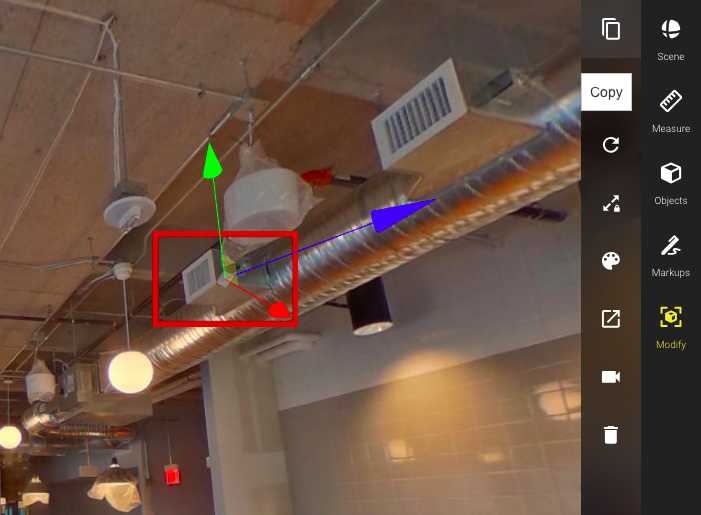 360 Markups can be used to highlight different aspects in a scene and keep a log of issues. 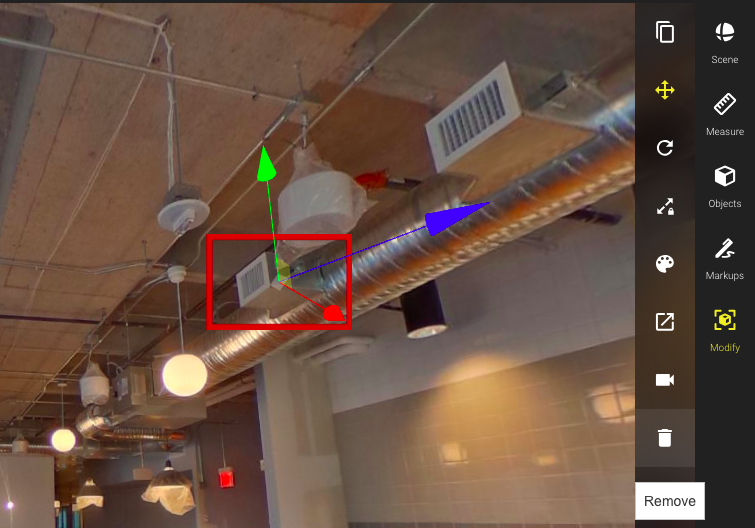 HoloBuilder Markups are annotations you can add to your 360° photographs. They can be used to visually highlight specific details or areas within a scene and can have a title as well as a descriptive text. Markups can be be a very helpful tool when informing stakeholders about detailed information within a project, and can also be used for advanced collaboration. If you connect HoloBuilder to Procore, you can also create and sync Observations and RFIs from within your HoloBuilder project. Open the markup tool list by clicking on the Markup icon 🖊️ on the right side of the web editor. The tools will be expanded below. Click again on the 'Markups' icon to close the markup tools again. management tools. Each cloud drawing will be saved as individual markup object. 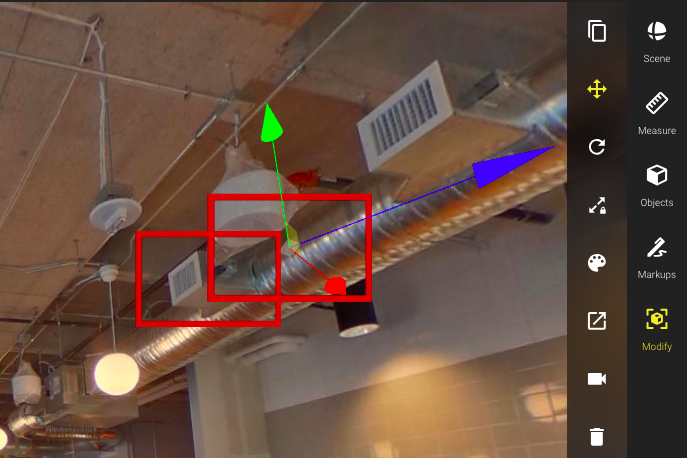 First, rotate your view of your 360° scene to the area you want to mark something. 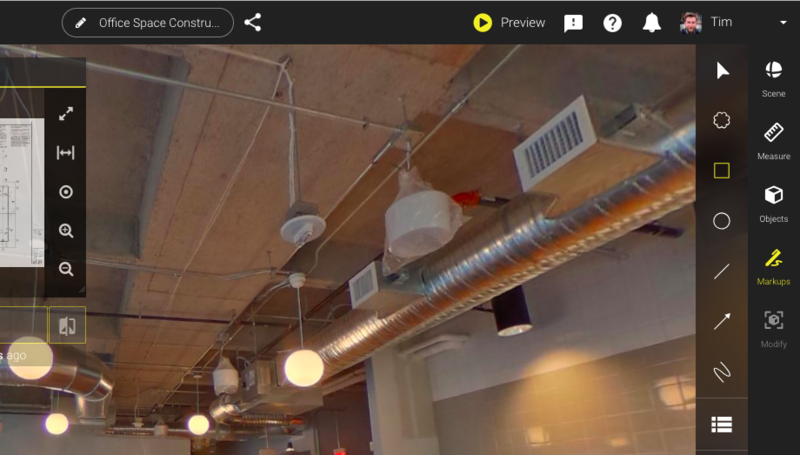 Please note that once you have the 360 markup tools expanded, you cannot rotate the view of on the 360° scene anymore. A markup can be duplicated by using the copy action. Click on the markup you would like to duplicate to open the 'Modify' panel. Click on the top icon in the appearing panel to duplicate the selected markup. The duplicate will appear in the exact same location of the markup that has been duplicated and appears invisible at first. Move the markup to see both the original and the new duplicate. Adjust the location of a markup by clicking and dragging on the colored arrows in the desired direction. If there are no arrows on the markup, click on the markup you would like to move first in order to select it. Select a markup by clicking on it. On the panel on the right, click on the bin icon to remove the markup. A dialog will open asking for confirmation. Click on 'OK' to remove the markup.